The beautiful community of Forest Lakes is located in North Myrtle Beach, South Carolina. It’s situated north of Possum Trot Golf Course between the Highway 17 and the Intracoastal Waterway. The smallest homes in this community can be bought for less than $200,000 and the homes that lead to the Waterway go for over 1 Million dollars. There is a wide variety of home styles here and we are sure you will find the perfect home for you. 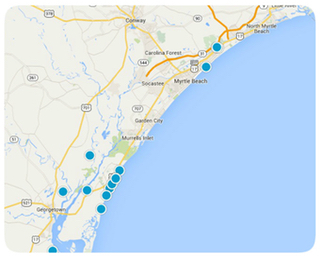 Residents are extremely close to the North Myrtle Beach Aquatic and Fitness Center. Residents also love that the community is quiet and isolated. There are many areas for residents to enjoy shopping, dining, entertainment, nightlife, golf, and outdoor recreation. Residents are also close to all of the amazing attractions that are in the Myrtle Beach area. Feel free to take a look at the beautiful homes we have available and let us know if you have any questions or interest.